Milk can be used as a way to stay hydrated during exercise and recover after a workout session. Milk is acceptable to consume before a workout session as long as you allow enough time for digestion before you exercise. Drinking milk too close to your exercise session may cause you to develop gastrointestinal distress symptoms that could affect the efficiency of your workout. Drinking a large quantity of milk before you exercise can make your stomach feel upset and tire you out quickly. If you plan to have milk as part of a small pre-exercise meal, allow two to three hours for digestion before your workout. Wait a minimum of three to four hours after eating a large meal before you exercise. A small pre-exercise meal may include low-fat milk or skim milk varieties. The fat in whole milk or two percent milk may cause stomach distress when exercising. Milk consumed before and throughout exercise may help prolong exercise sessions in athletes. 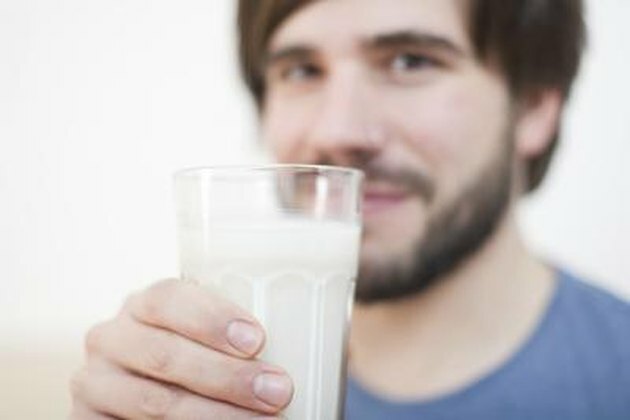 During a 2008 study published in "Nutrition," researchers found that subjects who drank milk and milk plus glucose had a tendency to exercise for longer than subjects who had water alone. Participants drank milk before and during exercise at 10 minute intervals for the study. The amount consumed was 1.5 milliliter per kilogram of body weight. If you are lactose intolerance, avoid milk before and after exercise. Symptoms associated with lactose intolerance include nausea, constipation, diarrhea and bloating. You must avoid milk and milk products that contain lactose. Consume lactose-free varieties of milk as part of your pre- or post-workout meals. Milk is a better choice as a post-workout beverage than a pre-exercise snack. Milk can be used to replace fluids along with replenishing carbohydrate stores. According to a 2006 study published in the "International Journal of Sport Nutrition and Exercise Metabolism," chocolate milk helps the body recover effectively between bouts of high-intensity exercise.